Agar agar is a gelling agent extracted from red algae, which is mainly used for setting jellies. Because gelatine is made from animal collagen, agar agar makes a viable vegetarian alternative. It still resembles seaweed when sold in strips. Though this is the traditional, South East Asian presentation of agar agar, it's most commonly found in Britain in powdered or flaked form. Agar agar has no scent, and doesn't leave any colouration or residue. The ingredient is detectable only through the mouth-feel of the jellies once they set. When gelatine is used to set jellies, they have such a low melting point, they literally melt in the mouth. When agar agar is used to set jellies, they have a higher melting point, meaning that the heat in diners' mouths isn't enough to melt the jelly. The result is a distinctive firmness. It's agar agar's high setting point which makes it a particularly popular ingredient in hot countries, as gelatine-set puddings would melt if left in the sun, and it also proves useful when putting savoury jellies on warmed, main course plates. Agar agar is low in saturated fats, with a high mineral content. It's often found in health food shops, or specialist vegan or vegetarian stores. Also look out for agar agar in the world food aisle of big supermarkets, or in a specialised Japanese section. Whether using agar agar in strips, flakes or powdered form, it is activated by being boiled in liquid for five minutes. By this point, the agar agar will have dissolved, and the liquid can be poured into moulds or ramekins, where it will set round 38-40°C. It is advisable to have high-accuracy scales when dealing with agar agar, because only a small amount is needed to set a large amount of liquid. If using powdered agar agar, then a chemist's spatula is also advisable. Recipes will usually specify amounts, but for a standard set, about 0.9g of agar agar will set 100ml of neutral liquid. The ratio should be increased to nearer 1.3g when using acidic liquids like cranberry juice, lime juice or pineapple juice. Because agar agar is flavourless, the emphasis is on texture rather than taste. Gelatine won't set high-acidity liquids, so agar agar will often be used as an alternative, as with Simon Haigh's lemon tart mix or Emily Watkins' rhubarb granita and gel. Agar agar will often be used to capture and set condensed savoury flavours, which go on a modernist plate, such as chef Adam Simmonds' cucumber jelly or Matt Gillan's soy sauce gel. It can be used to make jelly sheets, or even slow the formation of sugar crystals when making ice cream, as demonstrated in Daniel Clifford's ginger ice cream recipe which uses agar agar. The most traditional use of agar agar though, is using it to set a coconut milk panna cotta or pandan jelly. 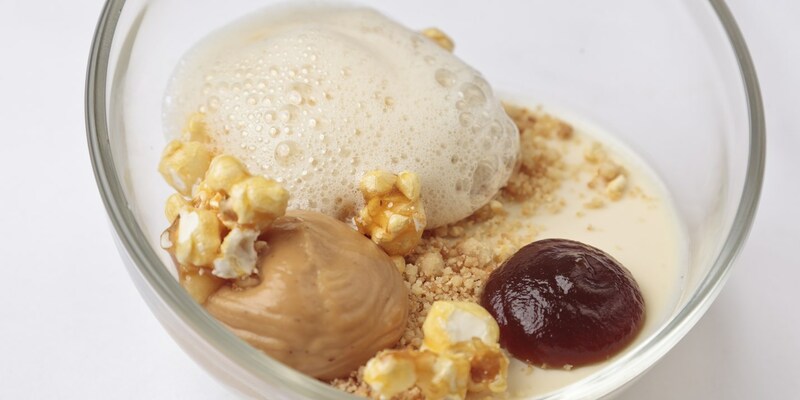 There are lots of variants on this traditional type recipe though, from Alan Murchison's sweetcorn panna cotta, to Michael Wignall's exotic tokaji jelly.